Come and Hear Some of the Latest Versions of Traditonal Folk Music of Eastern Europe with World Fusion Ensembles Dark, Dark, Dark and A Hawk And A Hacksaw: October 1st, Sunday @ 9:00 p.m.
American world folk sensations Dark, Dark, Dark and A Hawk and a Hacksaw will bring 2 new and different perspectives of Eastern European folk music to Boston’s Brighton Music Hall next month. Although I must warn you at this point that this is a standing room only event, I can also assure you that the experience should be well worth the lack of a seat as both bands are well-seasoned performers who have attained much success with adoring fans world-wide. A Hawk And A Hacksaw (More Info/ Sound Clips) – This dynamic twosome consists of none other than accordionist Jeremy Barnes and violinist and vocalist Heather Trost. 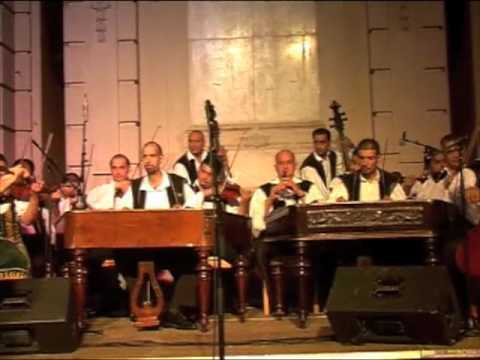 Sporting their own special blend of traditional genres from Yugoslavia, Greece, Turkey, Romania, and other regions of Eastern Europe, they produce a lively and uplifting repertoire, steeped in tradition yet embellished with a distinct contemporary flair. The pair maintain a highly unified artistic relationship as they perform, such is the style that always was and still is so very characteristic of this ancient musical art form. Although currently from Albuquerque, both Barnes and Trost took up a two-year residency in Hungary, honing their musicianship skills in the company of some of the nation’s top folk musicians. They have since produced their very own recording label centered solely around the promotion of Eastern European folk music. One of their latest most notable ventures has been their performance on a newly re-made soundtrack to the 1964 documentary film Shadows of Forgotten Ancestors. Dak, Dark, Dark (More Info/Sound Clips) – This world fusion band beckons audiences to take a fresh new look at their everyday living environment in order to gain a different perspective on what might otherwise seem like a rather ordinary existence. 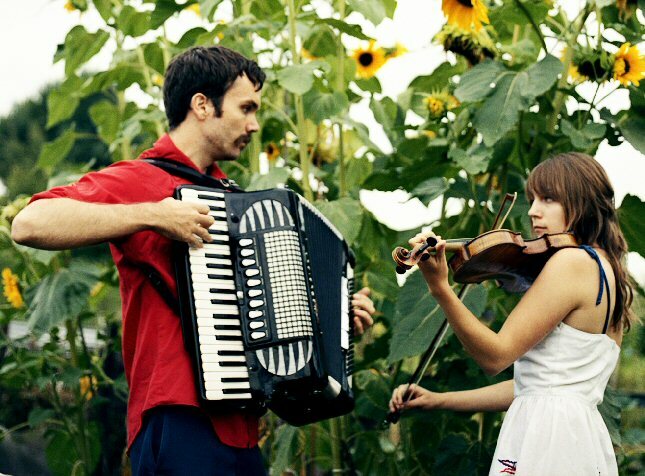 With their own avant-garde interpretation of New Orleans style jazz blended with, Americana, pop, and Eastern European folk genres, they will introduce you to a new and exciting world around you full of whimsy and enchantment as they stimulate your perceptive senses. The fact that these artists play so well together as one superb musically cohesive unit, explains their uncanny ability to combine a wide array of styles and elements within each of their compositions, the end effect of which often times possesses a haunting quality quite capable of penetrating the listener’s very soul. Dark Dark Dark has toured heavily worldwide in addition to many other ambitious pursuits. Their smash hit Daydreaming has been included on the soundtracks of notable TV productions Greys Anatomy, American Idol, and Degrassi: the next generation. So come on out to Boston’s Brighton Music Hall and find out the latest progressions in the world of Slavic folk music with premier artists Dark, Dark, Dark, and A Hawk and a Hacksaw. Also appearing will be Americana ensemble Pillas and Tongues bringing you more first-rate leading edge music! When: October 2nd, Sunday @ 9:00 p.m.
Come Take a Musically Unique and Highly Impassioned Tour of Haitian-Cuban Life, Such as It Was, before the Great Revoution of ’59 with the Creole Choir of Cuba: October 1st, Saturday @ 8:00 p.m. Ever wonder just how difficult life could get for an impoverished immigrant in a foreign land? 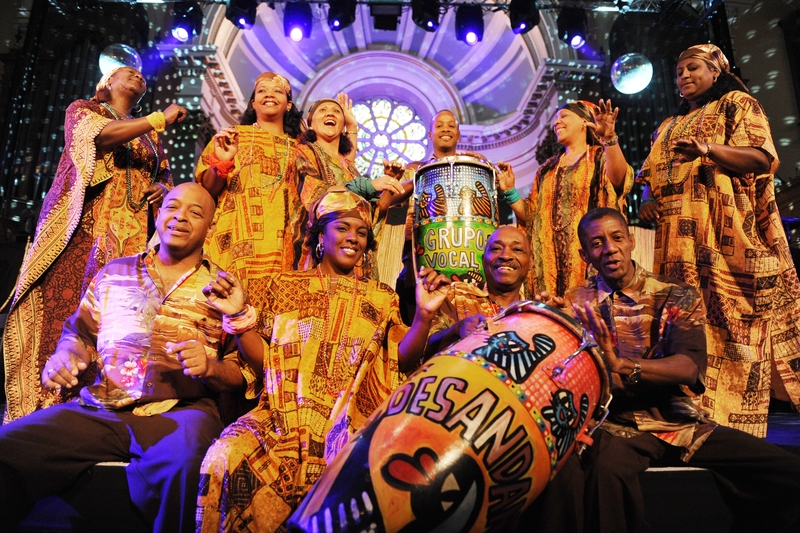 Well, get set to hold on to your hat because the Creole Choir of Cuba has come to really tell it like it was with an impassioned and gripping performance that will surly stir your emotions and inspire your senses. This enthusiastic ensemble of 10 vocalists tell their musical tales of hardship and endurance through a series of generally high-spirited inspirational songs and dances originating from Cuba, Haiti, and Dominica. Although there is some use of percussion instruments throughout their performance, the main focus is clearly upon a purely a capella somewhat gospel-like vocal style, that features an ever-present resounding bass-line which serves as a strong musical foundation. This group is known for their effective use of intriguing multi-layered harmonies set to Caribbean style rhythms, further embellished with contemporary Haitian musical touches for added audience appeal. 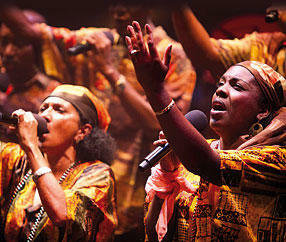 The vast majority of the choir’s repertoire is sung in Creole. Widely spoken in Cuba, the language originated with the African slaves who were brought to the area and developed it through the practice of combining French, English, and Spanish words with those of their own native languages. Each individual song in the choir’s repertoire is centered on an all important storyline, a little vignette as it were, of some aspect of everyday life in the existence of Haitian-Cuban sugar plantation workers during the late 18th, entire 19th, and mid-Twentieth centuries . 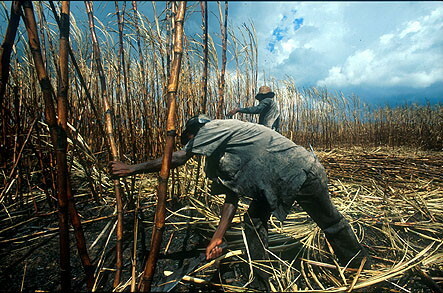 Already brought to Haiti as enslaved Africans, they ultimately fled to Cuba, as a result of intolerable violence due to a Haitian slave revolt, either to continue on as slaves or as immigrants forced to live in little better than slave-like conditions until the Cuban revolution of 1959 freed them from a life wrought with the ill-effects of harsh discrimination. Each and every choir member is a direct descendant of these people, singing the very songs that were sung by their ancestors and directly handed down through generations. Needless to say, this speaks to the authenticity of each and every performance as well as it emotional purity. The group remains steadfast in their mission to effectively communicate the true-to-life stories of their ancestors to the rest of the world through their most passionate music, an endeavor that in recent years has become infinitely more relevant on a personal level as a down swing in the Cuban economy has left much of the present day Haitian-Cuban community, once again sadly, in somewhat of an impoverished state. But the Creole Choir of Cuba stands firm in their faith in the power of music to forever uplift even the most disheartened of spirits, just as it did for their ancestors all those years ago. I, myself, believe in that power as well! It is on the heals of an extremely well-received performance at the prestigious WOMAD world music festival in the United Kingdom this past summer, that the Creole Choir of Cuba comes to Boston as part of their first US tour. There is no other music ensemble in all of Cuba that matches their unique style. So come to their Boston performance well prepared to be highly educated, truly inspired, and most-of-all musically satisfied. When: October 1st, Saturday @ 8:00 p.m.
See What Transpires When Carnatic Indian Music Traditions Meet Jazz in an Evening with World Fusion Artists Garuda: September 19th, Monday @ 7:30 p.m.
Berklee professor Bruno Raberg has been an accomplished scholar in the area of South Indian Classical, or Carnatic, music traditions for over a decade. As as both a talented performer and composer, he has concentrated his efforts as of late towards the expression of this most ancient genre in a jazz setting, which is then further enhanced with African and other world music embellishments. 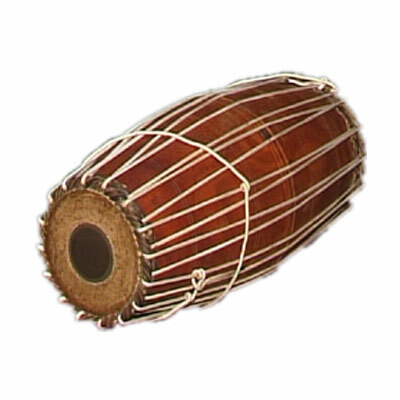 Raberg showcases this unique brand of world fusion jazz through his own original compositions as well as re-arrangments of traditional Carnatic works which feature the mridangam, a drum widely used in South Indian music repertoire. His overall compositional style is largely improvisational, a characteristic which he firmly believes lies at the very center of musical development in all its various forms. Such sets the musical stage for Raberg’s latest musical venture, world fusion ensemble Garuda. The group stands as an explicit expression of his latest compositional developments as they relate to this new and rather intriguing version of jazz. This highly accomplished acoustic and electric bassist has earned himself international notoriety both as a performer and a composer since arriving in America from Sweden 30 years ago. Performing or recording with such well-known names as Jerry Bergonzi, George Garzone, Sam Rivers, and Mick Goodrick, to name a few, Raberg has, in the process, participated in the making of no less than 36 cds, often as a featured artist. His highly valued contributions to the evolvement of contemporary jazz have been duly noted in such well-regarded publications as Jazz USA, Double Bassist, Jazz Matazz, and All About Jazz. He has also expanded his horizons as an educator, sharing his knowledge in classroom settings overseas in Europe, Mexico, and Central America. In addition to leading Garuda, he acts as director to the ensembles the Lifeline Quartet, the Bruno Raberg Nonet, and Ascensio, as well. Joining him as Garuda are collegues Fugan Dineen (mridangam, drums, and composition), Noriko Terada (percussion), Andrew Halchak (soprano/alto saxophone), Jussi Reijonen (guitar, fretless guitar, and oud), and Duncan Wickel (violin). (Additional Bios) So whether you view Garuda’s output as Carnatic Indian music in a new light or as modern jazz with a new twist, these world fusion jazz pioneers are guaranteed to provide you with a totally unique and enlightening musical experience. When: September 19th, Monday @ 7:30 p.m.
Aquire an Authentic Taste of Central European Roma Culture with the Rajko Ensemble @ Johnny D’s: September 15th, Thursday @ 8:00 p.m. Listen to the Rajko Ensemble. The ensemble’s website is mostly in Hungarian. Prior to 1952, the only real place for a professional gypsy musician to perform for a living was in a local drinking establishment. But then a native Hungarian with big dreams came along and changed all of that. Gyula Farkas established the now prestigious Rajko Music School of Romani performing arts in order to professionally train young gypsy musicians and dancers from the tiniest remote villages in Hungary, Slovakia, Romania, and the Ukraine. Only a very select group of young people are invited to Budapest to come study at this very special school from the tender age of eight until they are eighteen or nineteen years of age and well prepared to perform as members of professional ensembles of all sizes in the best of entertainment venues all over the world. The key to the students’ success, especially with respect to their amazing technical proficiency, is a constant exposure to an extensive training regimen centered around their natural inate ability to improvise music. 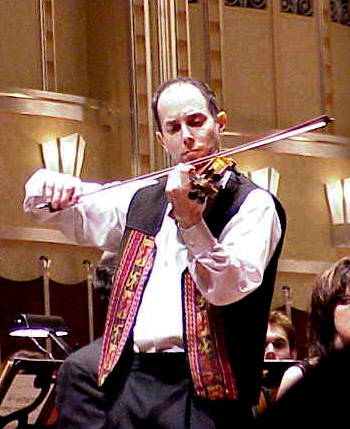 A major product of the Rajko School is the highly acclaimed 50 member Rajko Orchestra. Of course, there will not be nearly that many musicians on stage at Johnny D’s, but rather a small eight piece chamber group. Each and every member is a true virtuoso on the specific instrument which they play and some of them have been performing together for vitually 20 years or more! 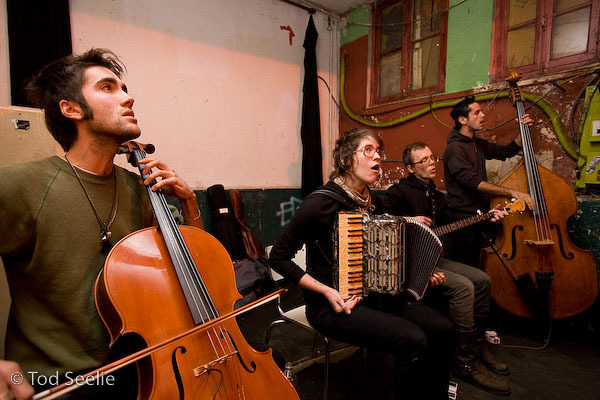 They will be bringing Roma traditional music of 19th and 20th century central Europe to the Boston audience, soley on authentic instruments matching both the appropriate time period and culture, so you know you are hearing the real deal here in its purest form. This premier folk ensemble has played in the most well-known and respected entertainment settings all over the world, performing for enthusiastic crowds in Europe, Australia, the Far East, and both North and South America. They have also accompanied the performances of top solo artists and dance companies, appeared on national broadcasts both on radio and television, and recorded an impressive number of cds. This highly revered ensemble has not appeared in the US in a very long time, which makes this particular performance all the more special for Boston area listeners. When: September 15th, Thursday @ 8:00 p.m.
Join Mexican Singing Sensation Magos Herrera for an Evening of Fabulous Jazz, World Fusion Style, at Scullers Jazz Club: September 14th, Wednesday @ 8:00 p.m.
Grammy nominated vocalist Magos Herrera is widely recognized as one of Mexico’s biggest contributions to the international jazz scene. As both a performer and composer, she managed to attract a huge fan base both in Mexico and Latin America at large with her strikingly progressive Latin jazz style. Upon relocation to NYC, Herrera continues to enjoy her popularity among US music fans as well. Communicating her songs to audiences in Spanish, Portuguese, and English, she successfully blends a variety of Latin-based stylistic elements into her compositions, among them: Brazilian rhythmic patterns, melodic motifs from various regions of Latin America, Mexican and Cuban dance features, and Andalusian influences. Add to all of this, a commanding stage performance fueled by the beauty and emotional appeal of Herrera’s voice, and you have an encaptivating performance of Latin jazz in a highly globalized form, masterfully crafted in such a way as to move the genre forward stylistically in truly innovative ways. Magos Herreras became a rising star on the United States jazz scene with a stellar performance at the 2008 New York Winter Jazz Festival. Back home in her native Mexico, she won a national award for “Best Jazz Concert of the Year” and was also called upon to produce and appear in various musical programs for Mexican TV. Her performance career spans over 12 years and includes appearances at such prestigious venues as the Kennedy Center in Washington, DC, Lincoln Center (NYC), and Lunario del Auditorio Nacional in Mexico City. She has also participated in both the Montreal and Barcelona International Jazz Festivals. Of the 6 cds she has recorded so far, her 2009 release entitled Distancia is her biggest success, landing her a most coveted Grammy nomination and spiraling to a #1 spot on the iTunes charts. She has enjoyed the privilege of recording with some of NYC’s premier jazz artists in the making of her two latest releases. Her newest entitled Mexico Azul (2010) features reinterpretations of past hits from her native country’s “cinema golden era” and XEU radio. So if you’re looking for Latin jazz with a new twist, Herraras definitely has the goods for you. When: September 14th, Wednesday @ 8:00 p.m.